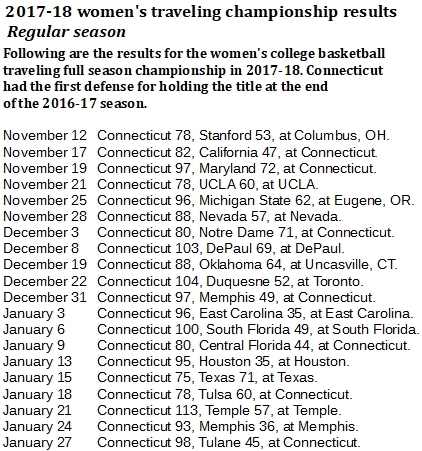 Three years into starting the women's college short version of the traveling national championship, Connecticut has yet to lose. The Huskies have run their winning streak to 86 games through 2017-18. We were remiss to not introduce the short-season women's college basketball championship earlier, but there wasn't any point. And, really, there still isn't. We started tracking it in 2015-16, same time as the full version that includes the postseason tournaments. Of course, the team charged with the first defense was Connecticut, the defending national champion. 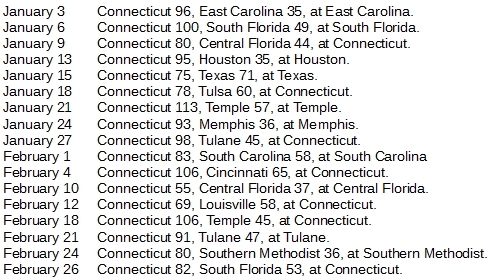 Combine that with no postseason to derail UConn, and you can imagine how this has gone. Three years into this thing, UConn still hasn't lost a game. The Huskies are up to 86 straight wins, far outpacing their 73 straight for the full-season version. That streak snapped with a 66-64 loss to Mississippi State in the 2017 NCAA Tournament semifinals.